Are you looking for a holiday cottage on or near the Gower Peninsula but are not sure where is the best place to stay? Our Gower cottages are located on a farm, just to the north of the Peninsula which many of our guests love to explore during their stay, before retreating to the comfort and cosiness of their self catering cottage back in the countryside. The Gower Peninsula (or Penrhyn Gwyr) is one of the most beautiful corners of the British Isles with several “must-see” sights for anyone visiting South Wales. Take a look at our unique holiday cottages. The highlight for many is Worms Head (from Old English wurm, dragon) and the magnificent Rhosilli Bay – a three mile expanse of golden sand, backed by a lush green hillside, that bears the full might of the Atlantic swells (great surfing!). Worms Head is an outcrop of grass-covered rock that has the appearance of a basking Welsh dragon. The cafe-bar at the Worms Head Hotel has splendid views. The nearby National Trust Rhossili Visitor Centre has maps and tide information which you must read before walking out across the causeway onto Worms Head. Another favourite is Three Cliffs Bay. All the Gower beaches are 15-30 miles from our cottages – and you can stop for an ice-cream halfway in the Mumbles . By the time youve taken a trip to the Gower Peninsula (or Penrhyn Gwyr) which juts out from the south coast of Wales, the phrase area of outstanding natural beauty may sound something of an understatement. Easily done in a day, you can explore the peninsula from east to west or vice versa – either way, it will only take you an hour to reach it from our farm cottages. 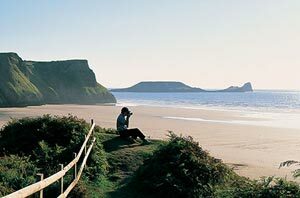 Gower features some of the finest beaches in Wales if not the UK, and provides you with stunning coastal scenery along with many fine pubs and restaurants within its 70 square mile area. Beaches – These are plentiful and beautiful and will provide you with hours of fun. Whether you prefer the lighter exercise of walking or something a little more daring like surfing or windsurfing, the beaches around the peninsula cater for all this and more. Many of the beaches here are award winners; the bays at Bracelet, Caswell, Langland and Port Eynon all hold Blue Flags. They also vary in size “ dependent on the time of year, you may even find you have your own private bay to explore. There are over twenty beaches for you to discover when you visit us “ all within 30 miles of the cottages so there really is no excuse not to make the most of these fabulous suntraps right on your doorstep. Just watch out for the incoming tide! Castles – Gower Peninsula also has a rich history, and this is shown by the half-dozen castles dotted around the area. The more interesting of these to visit are Oystermouth castle and Oxwich Castle. The former has been recently renovated to an excellent standard and now includes a special platform which gives excellent views across to The Mumbles and Swansea Bay. Whilst there, you may also wish to check out the pubs and restaurants along the famous Mumbles Mile where youre sure to be welcomed, fed and watered in equal measure. Oxwich castle is one of the best kept castles in Wales, and boasts a wonderful view over the bay as well as many features remaining of the original castle itself. Our Gower cottages are located on the historic Plas Cilybebyll estate, just to the north of the Peninsula. This location afford many benefits to our guests. Not only do our cottages come with over 100 acres of beautiful private grounds but they are could not be better places for accessing many other highlights of South Wales, which makes them very popular with those interested in Brecon Beacons Cottages also. Our location means you get the best of both worlds – beaches and coastline one day, countryside and mountains the next! Examples of a more ancient history are also common. The famous Arthur’s Stone is a must for anyone with an interest in prehistory, and is one of the most impressive chambered tombs still standing anywhere in the UK. Kids might enjoy a visit to the Gower Heritage Centre, which celebrates local craftsmanship and tradition. It’s also home to Wales’ smallest cinema. Other highlights of the peninsula must surely include Worms Head, which stretches out from the western end. It is possible to walk out onto Worms Head when the tide (and the local information point) sees fit and from there you will be able to take in some stunning panoramas as well as getting a little exercise into the bargain. There is also a very popular caf bar there, so after your bracing walk you can head in for some tasty local treats to refuel you to your next port of call. Close to Worms Head is the stunning three-mile long expanse of Rhosilli Bay, which is not only great for a coastal walk with its clifftop and beach, but is also very popular with surfers from near and far and is closely linked with the lovely village of Llangennith. For a Gower Holiday, our cottages are ideal. We’re also more than happy to help you plan a trip and make sure you see all the best of this beautiful part of the world.